Prosthetic vascular graft infection is one of the most serious complications after vascular surgery. Fibrin gel (FG) has many useful characteristics as biocompatibility, biodegradation, adhesion and haemostasis for development of local antibiotic delivery system. In this study, human plasma was collected from peripheral blood that was used to create fibrin gel by supplement ion Ca2+. Fibrin gel containing antibiotic was then evaluated in some characteristics such as surface structure, biodegradation, delivery antibiotic, cytotoxicity and prevention of bacterial biofilm in vitro. The results showed that fibrin gel was excellent material for extended delivery of antibiotic. Most importantly, fibrin gel containing antibiotic were not toxic for human fibroblast cells in vitro and inhibited growth of bacterial biofilm in vitro. This research as the first step for development of antibiotic delivery system for effective treatments for graft infection. 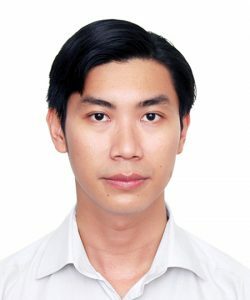 Vu has completed his Master of Microorganism at the age of 25 years from University of Science, Vietnam National University and has attended Animal Physiology Major PhD program at the University of Science, Vietnam National University Ho Chi Minh City. He is deputy head of Department of Physiology and Animal Biotechnology and researcher at Laboratory of Tissue engineering and Biomedical materials (TEBM). He has published more than 10 papers in international journals.